Sometimes the folks at SAS Institute don’t brag as much as they could. You won’t hear them boasting about how great the pivot tables are in SAS Enterprise Guide. In fact, if you search for the words “pivot table” in the Enterprise Guide online help, the only entry you will find is something about the OLAP Analyzer. That’s not what I’m talking about. I’m talking about the Summary Tables task. The Summary Tables task creates pivot tables, and it does a great job of it too. SPSS creates pivot tables, and Microsoft Excel creates pivot tables. I’m not an expert on either of those software packages, but from what I’ve seen, there is no comparison between pivot tables in SPSS or Excel and in Enterprise Guide. The Summary Tables task is the clear winner for ease of use, power, and beauty. Ease of use: A few years ago, Lora Delwiche and I presented a hands-on-workshop about Summary Tables at SAS Global Forum. The presentation was well-attended and well-received. However, when we wanted to repeat it the next year, the Section Chair asked us to present something “a little harder.” That’s right. Summary Tables was too easy to use for SAS Global Forum. It’s a shame too, in my opinion, because being easy to use is not the same as being obvious. When you open the Summary Tables task, it’s not obvious how powerful it is, how beautiful the output can be, or even how easy it is to use. But if someone shows you, then you can learn it all in a flash. Power: The list of statistics you can produce in Summary Tables is long, to say the least. I think it’s safe to say that you would have a hard time matching it in some other software package. Not only that, but the flexibility you have in arranging your table is amazing. I know the folks at SAS Institute are working on some innovative new reporting features that will greatly exceed Summary Tables in flexibility, but when it comes to arranging summary data in a rectangular table, Summary Tables already does it all. Beauty: Summary Tables gives you point-and-click access to the Output Delivery System. As anyone familiar with ODS knows, you can always control the overall style of SAS output, but Summary Tables does something special. With Summary Tables you can also control individual parts of the table. You can customize font, size, foreground and background color, centering, and much, much more. In addition, you are not limited to some proprietary format. 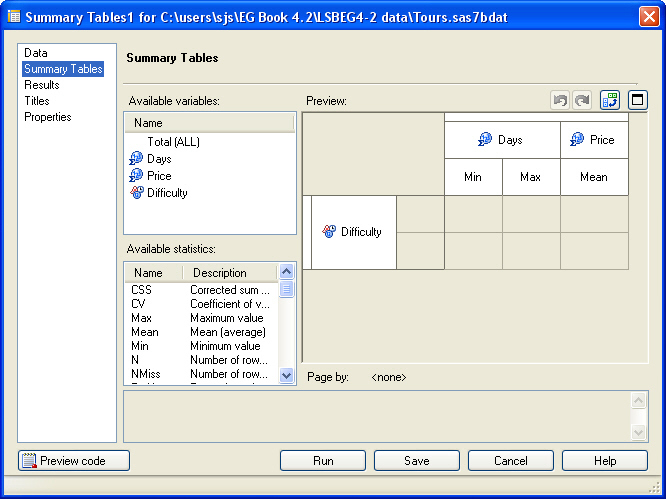 After you have created your table, you can output it in HTML, PDF, RTF, or even as text output or a SAS data set. In this posting, I take a break from talking about SAS to talk about the books of the future and the future of books. I do not own an e-reader. I am a collector of books, good old-fashioned hold-them-in-your-hands-and-turn-the-pages books. My collection includes a copy of Winne the Pooh with a copyright date of 1925 (one year before the book is said to have been first published, something I can’t quite figure out), and a copy of The Norman Rockwell Album, autographed by the artist with a tiny sketch of a dog. I, for one, am going to continue to buy and read paper books. However, I can see how useful an e-reader would be for reading technical and academic books. And I thoroughly expect to use an e-reader in the future–when the technology is good enough. 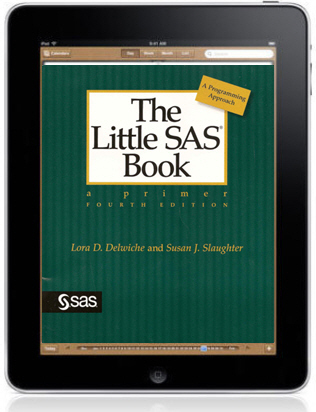 At SGF 2009, I had the privilege of seeing The Little SAS Book on a Kindle. The result was not impressive. The formatting was pathetic, even distressing in a book where formatting is an important part of communicating the content. The images we had worked so hard to create were missing! Clearly, e-readers have a ways to go…but perhaps not as far as I once thought.